The LTC Levelogger Edge logs conductivity, water level and temperature. It combines a datalogger, 8-year battery, Hastelloy® pressure sensor, temperature detector, and conductivity sensor within a small waterproof housing, 7/8" x 7.5" (22 mm x 190 mm). A Titanium ceramic PVD coating protects the body against corrosion. The conductivity sensor is a 4-electrode platinum sensor, with autoranging capabilities. The minimal maintenance, sealed LTC Levelogger Edge is simple to clean and calibrate, even in the field. Using Levelogger Series Software, it displays conductivity, temperature, and temperaturecompensated water level. Calibration and Data Wizards guide you through the calibration process and barometric compensation, to provide corrected data. Levelogger Software allows you to easily program your preferences, download data, and display data in a graph or table format or export to other programs. The Real Time View option allows immediate viewing of live conductivity, water level and temperature readings. Leveloggers are easy to deploy; installation can be with direct read cables or wireline/cord suspension. The LTC Levelogger Edge is SDI-12 compatible using the Solinst SDI-12 Interface Cable. 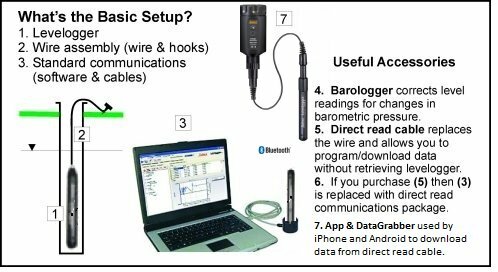 Data can be downloaded in the field using the DataGrabber™ USB data transfer device, or through Bluetooth® using the Levelogger App Interface device. The LTC Levelogger Edge is also compatible with the 9500 LevelSender telemetry system, designed to send your data wirelessly by email or SMS. The Solinst Levelogger App is designed to communicate to Solinst dataloggers via your smart device. Programming options include start/stop, data downloading, linear and real-time sampling, future start/stop, and GPS coordinates. The Levelogger App Interface uses Bluetooth® wireless technology to connect with your smart device running the Solinst Levelogger App. Use our Levelogger App Interface and a Solinst Direct Read Cable, to communicate to a downhole Levelogger and email data files right from the field (see Model 3001 Solinst Levelogger App & Interface data sheets). Instantly add cellular telemetry to your LTC Levelogger Edge by connecting to a Model 9500 LevelSender. Send data by email or SMS from your remote stations to your desired location. The LevelSender simplifies your telemetry setup, by working with Solinst direct read cables and is compatible with the full Levelogger Series product line. (see Model 9500 LevelSender data sheet).